Most people who visit Barcelona are sure to spend at least some time at one of the city’s beaches. Yet few are aware that when seeking respite from the bustling urban streets, heading up into the forested hills above the city can be just as pleasant. Vallvidrera, a village at the entrance to Collserola National Park that offers gorgeous views of the surrounding forests and the city below, is just the place for such an excursion. Starting in the early 19th century and up until the 1980s, Vallvidrera served as a vacation destination for wealthy Barcelonans who wanted to escape the summertime heat of the city. The abundance of mansions here, many built in the Modernist style, is a testament to this bygone era. 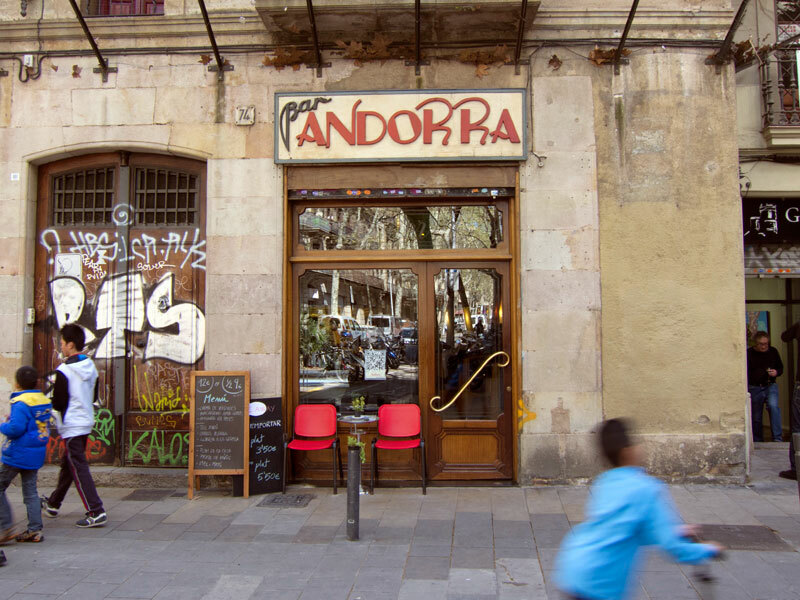 Nowadays, although Vallvidrera is a year-round community that is technically part of Barcelona proper, it’s still a destination for local urbanites and their families wanting to get out of the city and relax, particularly on weekends. One recent morning, we took the 15-minute train ride from Plaza Catalunya to Peu del Funicular and then rode the Vallvidrera funicular up the mountain. After taking in the views and some beautiful Modernist architecture, we realized we were hungry, and in Vallvidrera the place to go when that happens is without a doubt La Antiga Casa Trampa. 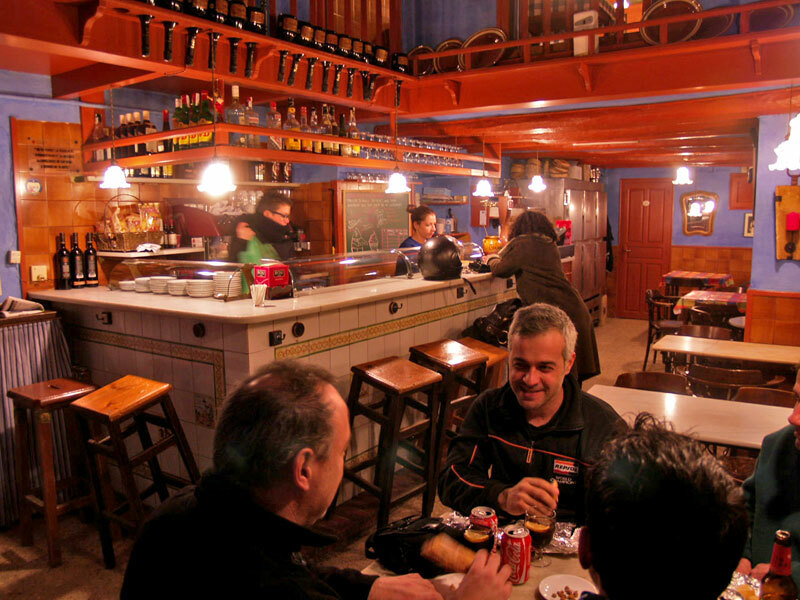 Founded in 1804, this small bar and restaurant has been in the same family for the past 80 years, since it was acquired by Daniel Martín Perez, a socialist who decided that out-of-the-way Vallvidrera would be a good place to avoid political persecution in post-Civil War Spain. Martín Perez renamed the venue La Antiga Casa Trampa after learning that the previous owner was known throughout the village as an abundant animal trapper who was always seen heading home in the early morning with the catches he found in his “trampas.” He spent some 40 years running the restaurant, during the early years actually living with his family in the back room, which now serves as the main dining room. His daughter Carmen, who was born in that very room, later took his place and when she died, her daughter, Silvia Baldellou Martín, took over the reins. In all this time, the food hasn’t changed much. 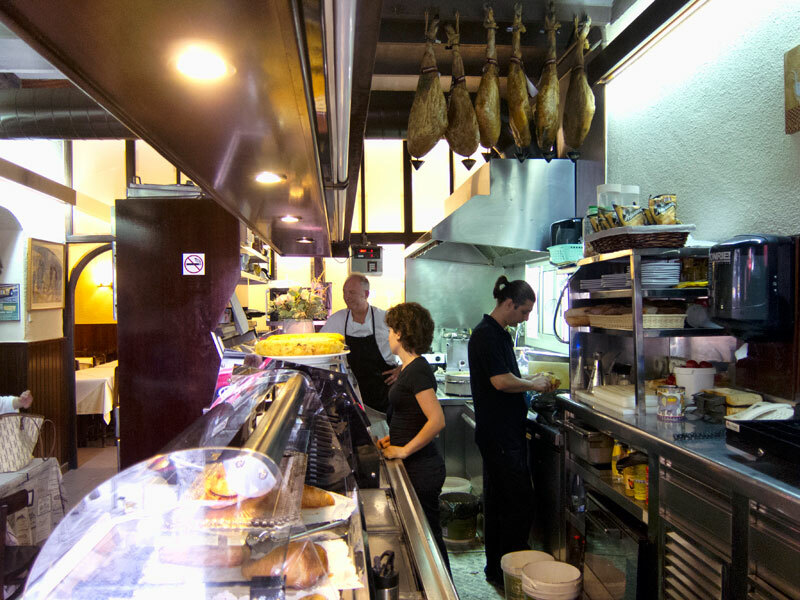 Casa Trampa is known throughout Barcelona for the quality of their jamón, which they get from a supplier in a small village in Salamanca. Many of the dishes on the menu, such as the famous guisantes con jamón de Jabugo (peas with cured ham made from acorn-fed black Iberian pigs), were first cooked by Silvia’s grandfather Daniel more than 50 years ago. The food is, to put it quite simply, comida de abuela (Spanish grandma food), and we mean that in the best possible way. 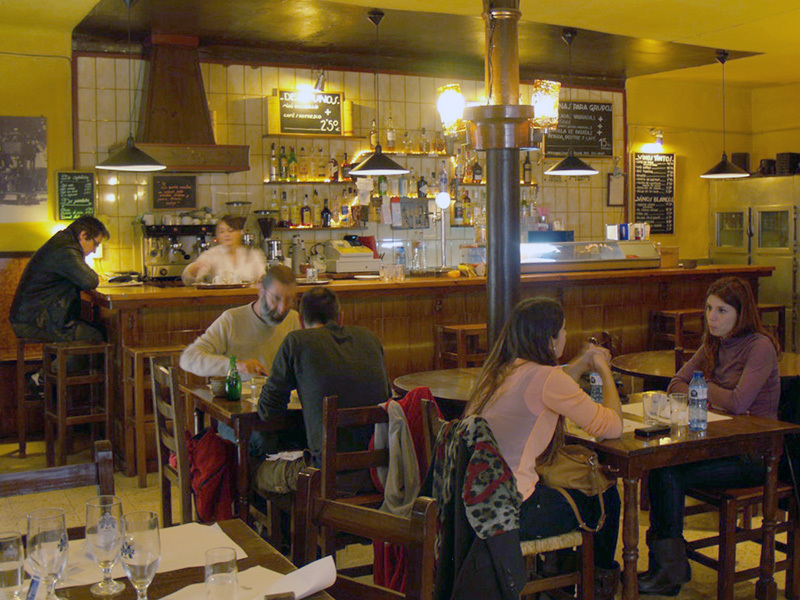 As for the décor, it is decidedly down-at-the-heel but, in our opinion, this is more than made up for by the numerous old photos on the walls that show the establishment and the surrounding streets of Vallvidrera over the past 150 years. At Casa Trampa, there isn’t anything fancy on the menu, nor is there a multitude of choices, just excellently prepared standbys like ham croquetas, albóndigas con samfaina (meatballs cooked with tomatoes, eggplants, peppers, garlic, zucchini and olive oil), and chicken stuffed with cheese, plums, ground beef and onions. As with most home-cooked dishes throughout Spain, almost everything on the menu – from the stewed pigs’ trotters served with judías (baked beans) to the galtes de cerdo (pork jowls, a fatty and flavorsome cut of pork similar to bacon) served with baked potatoes and onions – starts with sofrito, a mass of tomatoes and onions that are slowly cooked together in order to form the base of the dish that will follow. 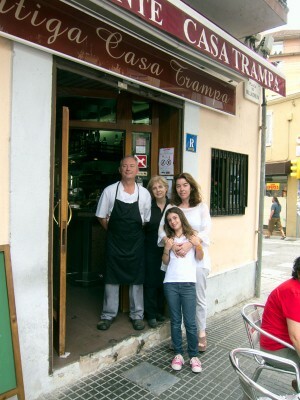 Casa Trampa is a family business in every sense and it’s not only the Martís who have invested their time and love over the years. 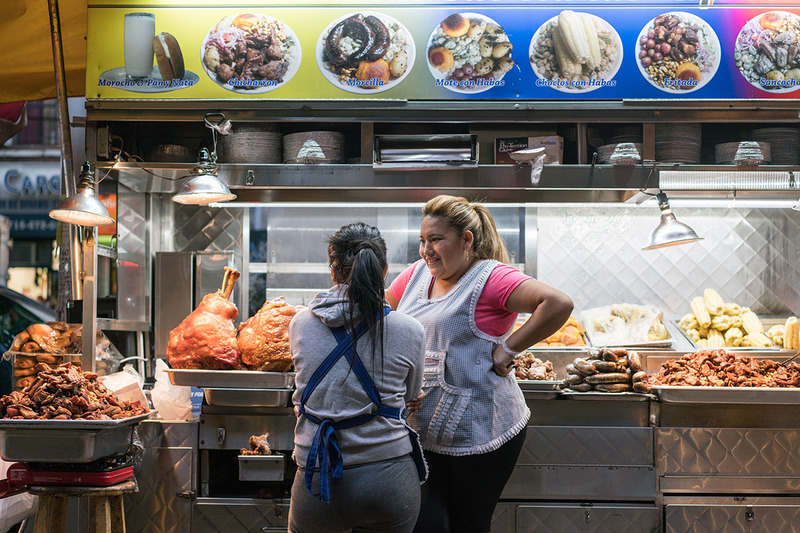 Antonia Cobo started working at the restaurant some four decades ago, when she was just 14, and has now worked for three generations of the Martí family. 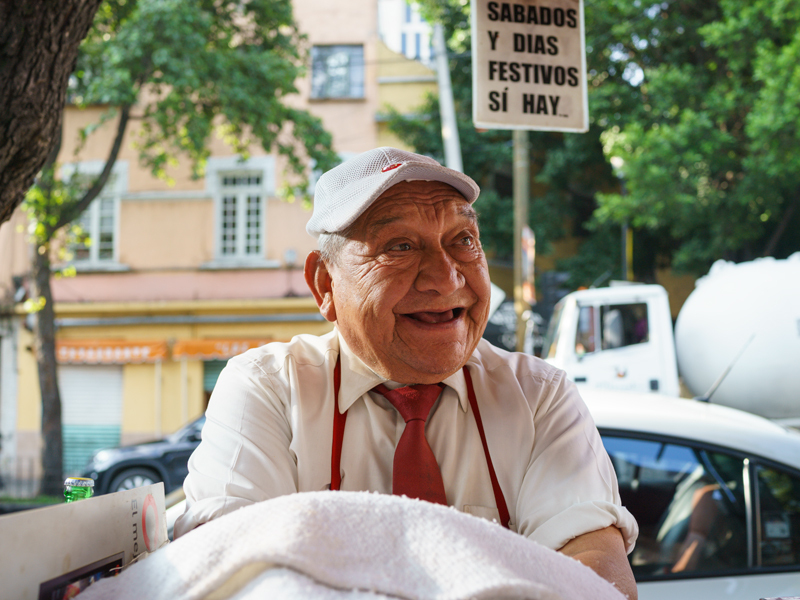 She even met her husband, Javier, when he came to work as a cook at the restaurant, and the two of them are still there every day (Antonia is now the dining room director), preparing and serving the homey food that the restaurant has been making for as long as anyone can remember. We ordered the menú del día, which included the typical primero and segundo platos, dessert and a small carafe of wine. Our primero plato was a heaping serving of macarrones (macaroni) cooked in a delicious béchamel sauce with chunks of jamón and mushrooms and covered with grated Emmental cheese. Next we slurped up some stewed beef – savory and tender in all the right spots – which came with mushrooms swimming in a tasty sauce made with tomatoes, onions and peppers, and with a side of crispy patatas fritas (French fries). By the time dessert came around we felt like we could barely fit into our chairs but we still proceeded to try the buñuelos con nata – essentially donut holes, only better, because they came dripping with honey and served with a few dollops of fresh whipped cream. In the end we hadn’t tried anything new (if you don’t count the fancy donut holes) but then again, we weren’t really looking for anything new. 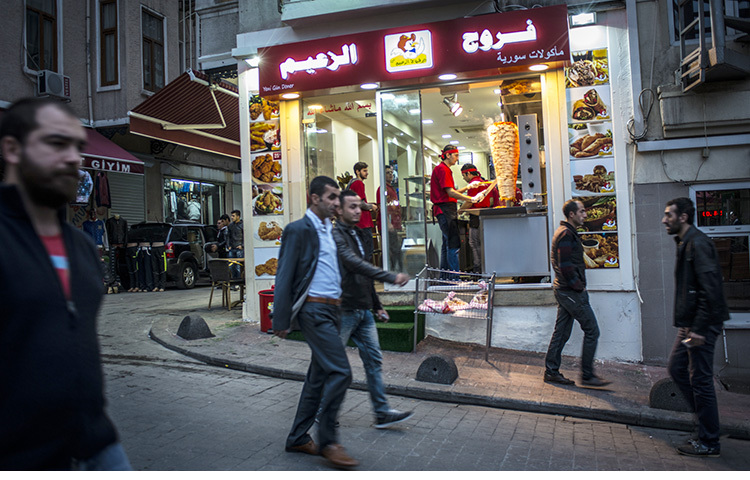 All we wanted was some home-cooked food that tasted as good as it smelled, and that’s exactly what we got.